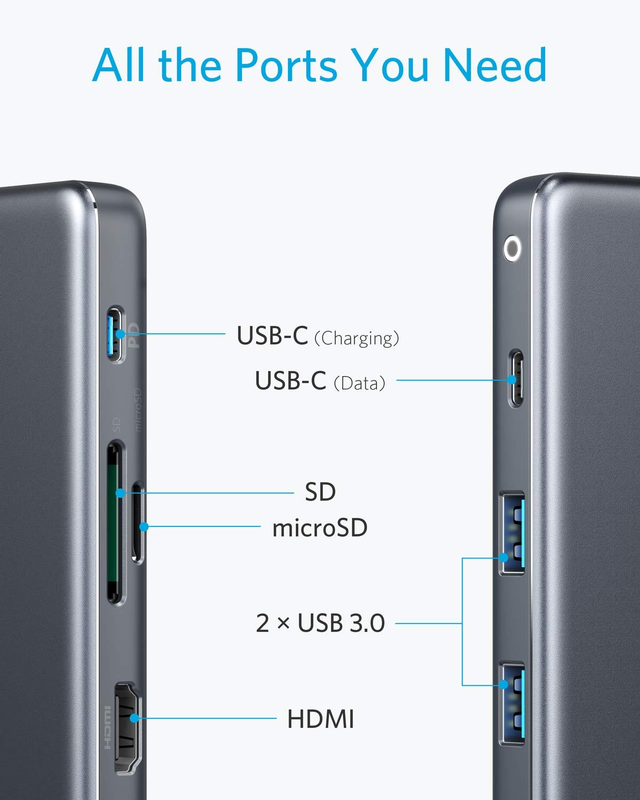 Now we’re not naming names, but have you ever had a laptop with only 1 or 2 measly USB-C ports? There’s no denying the speed and reliability of USB-C Power Delivery charging, but what if you need to plug in a mouse? And if you were hoping to make a PowerPoint presentation via HDMI, from a USB drive, while making sure your laptop doesn’t die mid-meeting? Forget about it. Suddenly, you find yourself wondering why you dropped top dollar on this laptop that arguably has less functionality than your desktop computer from 5 years ago. What was [CENSORED COMPANY NAME] thinking!? Well, we’ve been busy thinking up a solution. Enter the Premium 7-in-1 USB-C Hub. This hub supports high-speed data sync letting you transfer movies, full seasons of TV shows, or an entire music library in mere seconds. Then, display your media in vivid 4K via the HDMI port. Hot-swap accessories to your heart’s content, and transfer massive numbers of photos and files from cameras or other equipment to your laptop, thanks to universal compatibility with SD and TF cards. But the best is yet to come. This hub conducts an enormous 100W of power, but only requires 20W to operate. Where is all this extra power going, you ask? Straight into your laptop, of course! That 80W Power Delivery output is enough to provide a MacBook with a full-speed charge—while you’re using all these extra ports and features. A word to the wise: this hub’s USB-A ports are optimized for SuperSpeed data, but this means that they aren’t designed for charging. Also, you’ll want to remember that hubs of this type aren’t compatible for transferring data to and from iPad Pro 2018. For your other devices, however, the Premium 7-in-1 USB-C Hub is the ideal accessory for any situation, transforming your single USB-C port into a powerhouse of productivity. To start making USB-C work for you and not against you, take a look at our Premium 7-in-1 USB-C Hub on Amazon, and use code AKCHUB46 when you check out to get 30% off. For hubs with different port configurations (including Ethernet-enabled hubs), check out our entire range of USB-C charging hubs available on Amazon now. Power On! With Power Delivery! 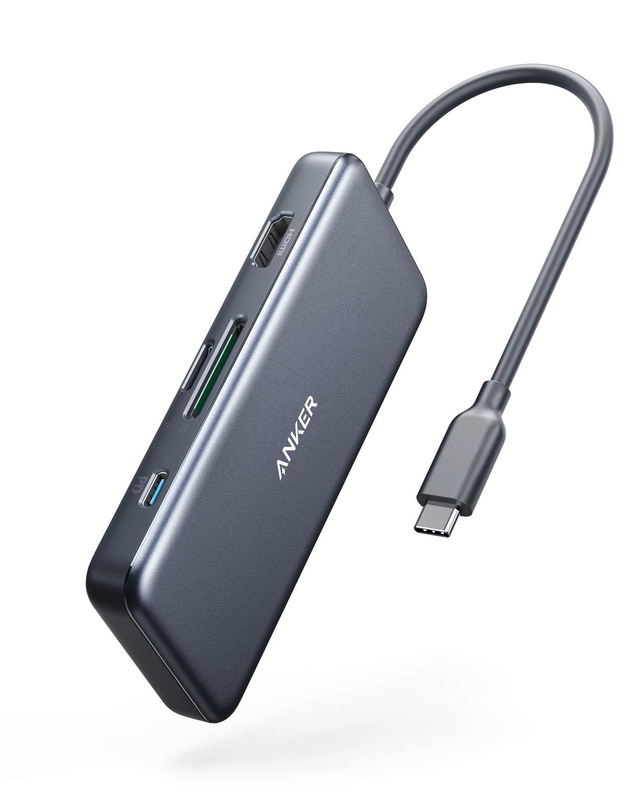 Anker 5-in-1 USB C Hub, with 4K USB C to HDMI, Ethernet Port, 3 USB 3.0 Ports Due to high demand, this code is no longer valid. Odd it says all the ports you need then says if you need different ports you can get one of the others. Why didn't they put Ethernet in the 7 port? I guess the censored company is Apple. Be aware of USB version. I own the earlier HDMI dongle and I tried it last night on my USB-C OnePlus 6, USB-C Pixel C, USB-C Lenovo Tab 4 8 Plus, and none of them worked with HDMI as they are not USB 3 which can output to HDMI. So I keep with the Chromecast dongle and casting screen. When will anker support double displays on their hubs? It depends how many people need it! When will this be available on amazon.ca? Anychance to make this deal available to Amazon.fr ? It will be available on Canada market in April.